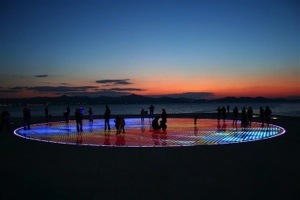 Anyone fancy a road trip to Zadar, Croatia? My pal, Rachel Marsden, has just blogged about and brought my attention to two incredible sound art installations Sun Salutation and Sea Organ created by architect Nikola Bašić with the help of Professor Vladimir Andročec (sea hydraulics consultant from the Zagreb Civil Engineering University). Sea Organ has been described as an “orchestra of nature” – the pipes were made by Goran Ježina, Heferer (Zagreb) made 35 labiums for every pipe, and it was tuned by professor Ivica Stamać (Zagreb). I adore that all-encompassing sensation of being consumed by nature… That reminder of one’s relative insignificance as part of the greater scale of things that can only be reached when truly submerged in a natural phenomenon. Having recently returned from a long-haul destination I spoke about this feeling to the mother-in-law before leaving. She’s not a fan of travel, but I love the reaffirming sensation of turbulence – the way that nature asserts it’s authority over man’s technological advances and tosses us about in the sky. Equally, I encountered this otherworldliness of our very real world whilst snorkelling on holiday, entering into entirely foreign territory thanks to a breathing aid… And again further excitement with the threat of a cyclone. I’m in no way glamourising nature’s potential for destruction, more marvelling at it’s wonder, and the way in which it chooses to remind us who’s boss… The mother-in-law wasn’t convinced! Anyway, back to Zadar. Read more about this sensational installation on Rachel’s blog here and find a link to an awe-inspiring video of the multi-faceted installation in action on Rachel’s blog too.